In the spirit of our predictions for the forthcoming year, we've dedicated our latest Scrum Seven to the young players that we think will make an impact on rugby's domestic and international scenes prior to a certain jamboree in New Zealand in September. 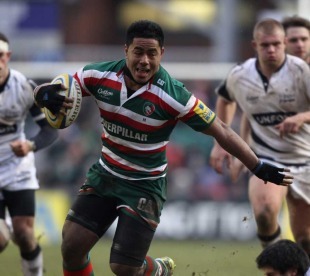 The youngest of the Tuilagi brothers, 'little' Manu has already shown the pace and power associated with his famous surname. In tandem with brother Alesana the 19-year-old enjoyed a vintage Christmas in a Leicester jersey, particularly with an eye-catching two-try display as the Tigers routed Sale Sharks. There's one big difference between Manu and the rest of the brood however: his future appears to lie in a white England shirt rather than the blue of Samoa. Having been granted a work permit in July 2010 he has quickly been linked with a place in the England squad despite his tender years and given the frailties of their midfield he could perhaps be just the antidote required somewhere along the line. The captain of New Zealand's victorious Under-20 side at last year's IRB Junior World Championship in Argentina, Bleyendaal has a big few months ahead after being named in the Crusaders squad for the inaugural Super Rugby season. The 20-year-old fly-half will be learning from the best, Dan Carter, as he looks to follow in the footsteps of his predecessor as Baby Blacks skipper, Aaron Cruden, who made his All Blacks bow in 2010. In contrast to the diminutive Cruden, Bleyendaal is a physical 6'1'' and 14 stones and has shown steely nerves already in his fledgling career. He scored 82 points at the JWC, including 28 in the final rout of Australia. An explosive No.8, the 20-year-old Faletau has already become a cult figure among Dragons fans. With his powerful play in the loose and monstrous hairstyle he has all the hallmarks of the best Pacific Islands forwards, which is fitting given that he is the son of Tongan international Kuli Faletau - who brought a young Toby to Wales when he signed for Ebbw Vale. A Wales Under-20 international, Faletau narrowly missed out on a Test debut at the tail end of 2010 as an unused replacement in the dour draw with Fiji. With the World Cup nearing and Ryan Jones looking for all the world like a second-row there is an opening in the Welsh back-row and Faletau seems to fit the bill. Jackson's first international points were three to savour for Scotland back in November, with his last-gasp penalty securing a narrow, but important, win over Samoa in Aberdeen. The Glasgow fly-half proved on that occasion that he has good temperament but it is his playmaking abilities that set him apart as an important player for Andy Robinson this year. Dan Parks' limitations with ball in hand are well founded and if the 22-year-old Jackson can prove that he has the chops to cut apart international defences then he has a long future ahead of him in a Scotland jersey. O'Brien's recent performances for Leinster against Clermont Auvergne in the Heineken Cup were mightily impressive and singled out the aggressive 23-year-old flanker as a major international-calibre prospect. With Stephen Ferris dominating the Ireland No.6 jersey O'Brien will perhaps find a home at openside on the international stage as the replacement for David Wallace, who is on his way to his 35th birthday. Combative at the breakdown and a dangerous presence with ball in hand, O'Brien is exactly the sort of player you'd want on your side in a scrap. Lambie's fledgling international career began with their difficult end-of-year tour in 2010 but the youngster will have emerged from the trip with his eyes that little bit wider. A prodigious talent capable of playing fly-half, inside-centre and fullback, it appears that he is destined for great things with No.10 on his back. His performance as the Sharks overcame Western Province in last season's Currie Cup final - 25 points including two tries - was a special one and while he failed to set the world alight in a Bok jersey he is only 20 and has time on his side. The forthcoming Super Rugby campaign will be a further test of his credentials as he is no longer an unknown quantity, but we think he'll do just fine. The IRB Junior Player of the Year, Savea will be hoping to make a dent with the Hurricanes this season. Blessed with searing pace, he scored eight tries during last season's Junior World Championship before being called up to Wellington's ITM Cup squad. His rise continued with a place on the 'Canes panel, where he will have the chance to learn from and test himself against All Blacks Hosea Gear, Cory Jane and Ma'a Nonu. At 20, he has already been tipped as the 'new Jonah Lomu' (who hasn't?) but you can believe the hype.